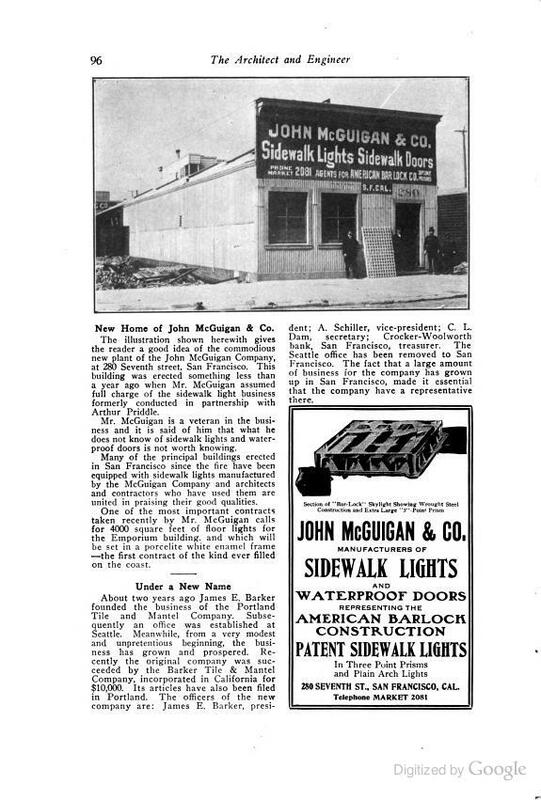 Up: United States John McGuigan & Co.
"New Home of John McGuigan & Co. The illustration shown herewith gives the reader a good idea of the commodious new plant of the John McGuigan Company, at 280 Seventh street, San Francisco. This building was erected something less than a year ago when Mr. McGuigan assumed full charge of the sidewalk light business formerly conducted in partnership with Arthur Priddle. Mr. McGuigan is a veteran in the business and it is said of him that what he does not known of sidewalk lights and water-proof doors is not worth knowing. 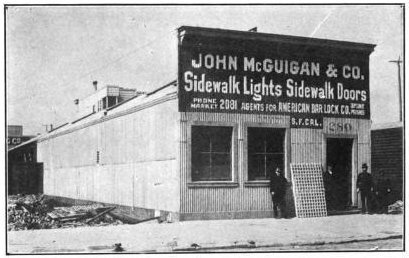 Many of the principal buildings erected in San Francisco since the fire have been equipped with sidewalk lights manufactured by the McGuigan Company and architects and contractors who have used them are united in praising their good qualities. One of the most important contracts taken recently by Mr. McGuigan calls for 4000 square feet of floor lights for the Emporium building, and which will be set in a porcelite white enamel frame—the first contract of the kind ever filled on the coast." 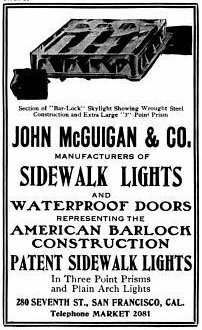 The 1908 ad (right) reads: "JOHN McGUIGAN & CO. / MANUFACTURERS OF SIDEWALK LIGHTS and WATERPROOF DOORS representing the AMERICAN BARLOCK CONSTRUCTION PATENT SIDEWALK LIGHTS In Three Point Prisms and Plain Arch Lights - 280 Seventh St., San Francisco, Cal., Telephone MARKET 2081"
None! Just a Google Books scan. See this Flikr photo of a SIMPLEX vault light panel by Tyler Sterkel. The brass logo plate reads "SIMPLEX / PATENTED MARCH 26th 1912 / JOHN McGUIGAN & CO. / 142 STILLMAN ST. / SAN FRANCISCO, CA". The patent referred to is presumably #1,021,548 by L. W. Mulford (which I haven't transcribed yet). Sterkel has a couple other photos of McGuigan ironwork, but they are not glazed.